Funky Finds: 8th Anniversary & Giveaways! Eight years ago today, I started this blog. What began as a hobby, creative outlet & way for me to spread the word about cool handmade stuff I discovered, unexpectedly blossomed into what is now my full-time job! I am so thankful for the opportunities Funky Finds has afforded me & my family, as well as all the funky artists, crafters, designers, authors & food makers we have met over the years. Thank you so much for your continued support of Funky Finds and handmade! We recently hosted the 6th Annual Funky Finds Spring Fling, our tenth art & craft show held in Fort Worth, Texas. Quirk Books, one of our generous event sponsors, donated Quirk DIY tote bags & copies of Sprinkles for our swag bag giveaways. 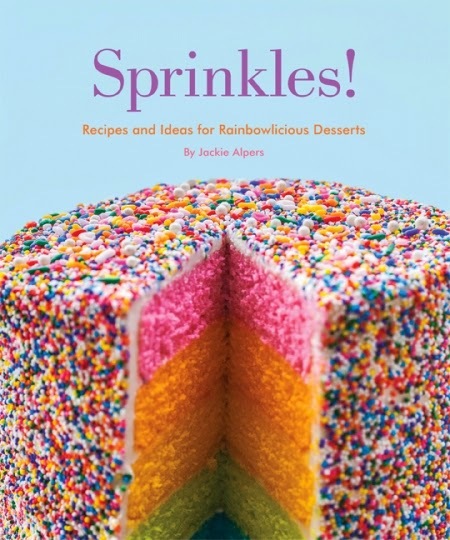 We received eleven additional copies of Sprinkles to giveaway on the blog! We also have some other goodies we're giving away as part of our anniversary celebration. Sprinkles is full of beautiful photographs of desserts that somehow incorporate cake sprinkles. There's also instructions & projects showing you how to swirl sprinkles into waffles, “embroider” them on cookies, and bake them into pretty pie crusts! You’ll find dozens of creative, colorful, super-fun recipes, plus quick-and-easy projects (ideal for little kids), holiday treats, and party-perfect edible gifts. • Six winners will receive a copy of Sprinkles courtesy of Quirk Books. • One winner will receive a FULL swag bag from our recent event (includes Sprinkles). as well as a Quirk DIY tote bag & copy of Sprinkles. as well as a Funky Finds tote bag & copy of Sprinkles. Congrats to Anne & Heidi V.
TO ENTER: Leave a comment on this blog post. Please include t-shirt size & email address. ADDITIONAL ENTRY: Like Funky Finds on Facebook & leave a comment noting that you have done so. Please include t-shirt size & email address. ADDITIONAL ENTRY: Subscribe to our monthly email newsletter, then leave a comment noting that you have done so. Please include t-shirt size & email address. ENDS: Thursday, April 10th, at 6pm CDT. Happy anniversary & congratulations! You guys deserve every happiness! Anne quiltedlovelies @ quiltedlovelies . com (size XL) Many thanks! Congrats! Thanks for extending your happiness to others! If I won a shirt it would be an XL. Many congrats and here's to many more! Much love from Craftster.org, too! My tee size is L! Congrats on 8 years! Here's to many more! It was great to meet you last fall at the Petticoats on the Prairie show! Hope you loved your Monkey Farts soap! Wow, congrats on 8 years! Size M. I liked on facebook. Facebook name Enelram Latsok. Thanks for the giveaway! Shirt size is small. Wow 8 years!! That's a lot, hope for many more!! Happy anniversary & congratulations! Congratulations on 8 years and thanks for the awesome giveaway! I'm a size medium. I like you on facebook (Patricia Yates Monk). My shirt size is L.
I like your facebook page and subscribe to the newsletter. Congrats on 8 years quite an accomplishment.